In addition to providing an environment of academic excellence in classrooms with terminally-degreed professors and liberal arts learning systems, Asbury University ensures that all students are given the tools needed to succeed. This week, we’re celebrating National Tutoring Week by putting the spotlight on the services available to help students perform at their very best in the classroom. The Center for Academic Excellence (CAE) strives to make students feel at ease in the tutoring environment. Currently, 36 students work in the CAE, working as peer tutors, writing consultants and academic coaches to help peers to strengthen their study skills. The CAE is divided into three main areas of service, which work in tandem to foster an environment of academic excellence: The Writing Center, Course Tutoring and Academic Coaching Services. These services are free and open to all University and Asbury Academy students. Students can get essay writing tips and have their papers reviewed and edited through the Writing Center branch. They can also get help with a specific class through Course Tutoring or get general help with study habits through Academic Coaching Services. Academic Coach Maggie Richwine ’20 points out that many students don’t realize how many services are truly available to them through the CAE. Not only does peer tutoring help the tutee with his or her academics, but it also helps to strengthen the academic life of the tutor. Halley McClain ’20 encourages her fellow students to take advantage of the on-campus tutoring services, pointing out the Biblical concept of discipleship in learning. 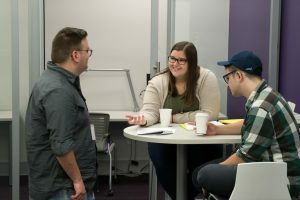 “Even Jesus’ closest followers needed clarification; tutors are here to help you learn by clarifying concepts and to work with you,” said McClain, a peer tutor in the sciences. Reid Matheison ’21 works as an academic coach for subjects like Math 120, Calculus and the math section of the Praxis exam. Matheison is enjoying his first semester working in the CAE and hopes his fellow students make use of the services offered. Peer Tutor Daisy Green ’20 finds that tutoring can be a rewarding experience for everyone involved. As of this semester, there are also embedded tutors in Strategies for Success in College (UNV 120), a class designed to set freshmen up for academic achievement during their time at Asbury. Academic coaches attend the course, lead discussion groups and meet one-on-one with students outside of class. Rossana Willhite is the course instructor and Leah Bowshier ’19 serves as the lead academic coach. Interested students can sign up for tutoring sessions by visiting asbury.mywconline.net. There are tutors available for all subjects with an abundance of tutors available so students can choose a time that works for their individual schedules. Applications to become a peer tutor open each spring. Students must submit resumes and faculty recommendations to the CAE. Qualified applicants are then selected to interview for positions for the following academic year. The Center for Academic Excellence is located in Kinlaw Library, Room 139. Students can stop by anytime Monday-Friday between 8 a.m. and 5 p.m.
Join us in thanking our wonderful peer tutors and Center for Academic Excellence staff this week for all of their hard work and dedication in fostering an environment of academic excellence on campus. Learn more about Asbury’s Center for Academic Excellence.